With Easter over, you may find you have a multitude of egg cartons lying around. We decided to experiment with egg cartons as building materials this weekend. Originally I had planned to give the boys a bunch of cartons and let them build. Nothing really happened with my idea. 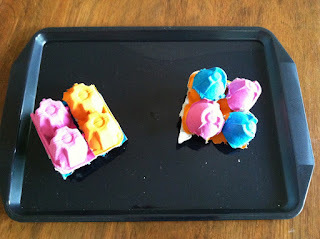 Plan #2 was to cut the egg cartons into pieces that resembled our Megabloks. They were still missing something so we decided to add some color to the mega bloks. The boys painted and I kind of cleaned them up for this project. Once they had the colorful new block shapes, the creative building began! I also found that the blocks made a great math manipulative. Beginning with a four piece carton, I would ask the boys to guess how many of the single piece cartons we would need to cover the four. Then we compared that to the two piece cartons. Lots of little math learning occurred as they discovered that two sets of two will cover a four piece carton. Here at Ready. Set. Read! we generally talk reading. But every Monday, I've started focusing on an early math skill. Feel free to check out these other Mathematically Speaking Monday posts. I created this post for Tinkerlab's Creative Challenge. If you have egg cartons to use up, check out the egg carton challenge at Tinkerlab. You can even link up your own idea. Here are the fantastic bloggers who are participating in the challenge. What a great way to teach the concept of area for math! We also did math with our egg cartons! 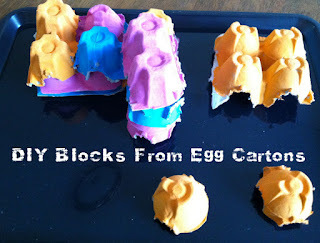 Great idea for using egg cartons! We have tons of egg cartons that I am always trying to use in different ways. (We eat about 15 dozen eggs a month!) I am going to have to read more ideas from the linky challenge.